It's amazing what one can find about businesses whose names have vanished from today's consciousness. In the late 19th century, the Hartford One Price Clothing Company was a thriving business. Hartford One-Price Clothing Co. is the first store on your left. Click on this picture and you'll be able to read the sign over the door. ...Signs on the left read: "Hartford One Price / 114-116 / Clothing Co." "Van the Hatter" and "Hardware." ... Electric street lights and utility poles line the street. Inscribed on back: "Asylum St. / Dec. 17, 1911." July 2015 and those plants are thirsty! Listed as the current occupant of 114 Asylum St. in Hartford at the former site of the Hartford One-Price Clothing Company, is McKinnon's Irish Pub. Who can resist that open door?! Parlor concert guests are introduced below. Thomas: Theodore Thomas of the Theodore Thomas Orchestra. Among other distinctions, Theodore Thomas premiered the famous (though not then) 3rd Symphony (The Organ Symphony) of Saint-Saens and the 5th Symphony of Tschaikovsky. Thomas was the first conductor of the Chicago Symphony Orchestra. Citizens of Chicago IL erected a monument to him, as best portrayed in Jyoti Syrivastava's blog, Public Art in Chicago. "There is one mistake that many people who try to sing Wagner's music make. They think it is loud and strong, and that so they must always practice at full voice. That wears out their voices. I have always practiced mezza voce, for, if you can sing a thing with the half voice, to yourself, you can always sing it with the full voice when you are before the public." "When the singer was asked for some personal reminiscences of the master whose music she had parsed so much tears swelled up in her kind eyes and she answered quickly: "No, I cannot talk of him. When I sing his music my whole heart goes out into it, but when I think that so good a man, so great a composer is dead, then—excuse me," and Materna tried to smile away some big tears and hastily turned the conversation to her pleasure at being in the golden California sunshine." If you are interested in voice training, the site from which the above quotes were excerpted, Voice Talk by Daniel James Shigo is highly recommended. Patti: Adelina Patti was a famous soprano. 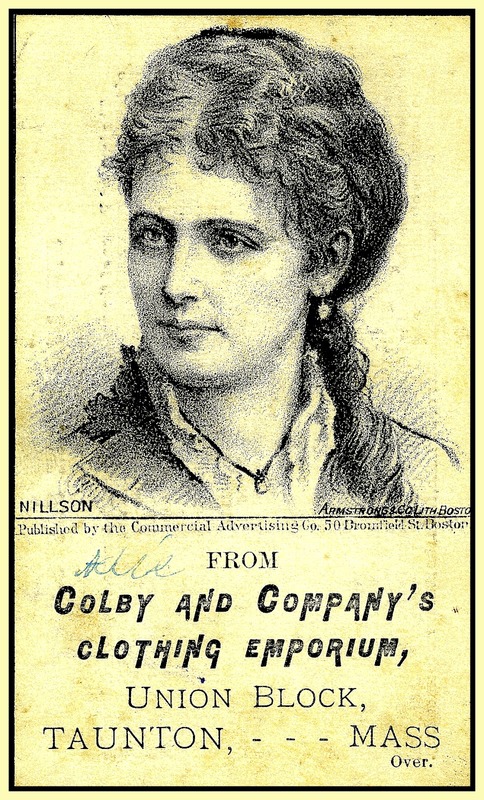 A trade card featuring Adelina Patti is on page 153 of the Earl J. Arnold Advertising Card Collection. YouTube has a six-part documentary on Patti's life. Nilsson: Christina Nilsson was a Swedish operatic soprano, a contemporary and rival of Adelina Patti. Liszt: Franz Liszt performed by Arthur Rubinstein. Here we go. Nice how we can weave these things together, isn't it! Richard Wagner's Tristan and Isolde, Opera, WWV 90, 1865 - Love Duet (fragments) conducted by Richard Wagner (1813-1883) with Amalie Materna, soprano, Albert Niemann, tenor, Marianne Brandt, mezzo-soprano. Bayreuth Festival Orchestra, Bayreuth, 1880. Wagner Conducts Wagner: Tristan Und Isolde, Grammofono. * The date of this recording may have been 1882. There seems to be some dispute about this. For further details, see comments on the original YouTube post.